Australian rural businesses have evolved to be some of the most innovative in the world, working to more efficiently feed the world’s growing population. The sources of economic growth have changed over time and Australia’s productivity surge in the 1990s has been steadily slowing. 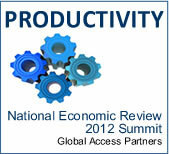 What are the factors that influence productivity and what policy options exist for leaders? 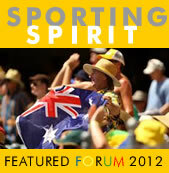 Australia has a long proud history of sporting achievement and involvement. What is it about sport that has seen it become an integral part of our lifestyle, the way we think about ourselves? 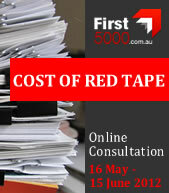 Australian businesses would benefit from the reduction of unnecessary regulation and red tape. It is seen as a significant strain on our national productivity and a significant barrier to job and wealth creation. We would like to thank everyone who participated in the online consultation on Strata Law reform. We had an amazing response and your comments have been included in a report which was presented to the NSW Government in May 2012. While you are no longer able to comment on the consultation questions, we invite you to read the submissions which will remain on the site as a record. 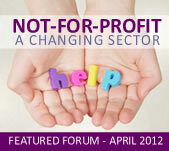 If you would like to receive updates on Strata Reform, please contact us at strata@openforum.com.au. Thanks again for your support. Ever notice how when your friends go on holiday to "get away from it all", they still find time to post photos of themselves on Facebook, lying on a beach or drinking a cocktail, just to show you they are having a good time? Perhaps it’s no surprise that social media has become an integral part of the holiday season, as it has so many other facets of our lives, as both holidays and social media are all about sharing experiences, building memories and making friends. Is life in Australia getting better? Of course that depends on who you ask, but in Australia most indicators show that while our gross domestic product (GDP) rises, our sense of satisfaction in our lives declines. By most measures Australia is a very fortunate country. After all, we are being told we have avoided the worst of the global financial crisis, we have beautiful beaches, stable government, and a high standard of living. What will life in the future be like? If we don’t have a hand in shaping the future, we might end up well behind the rest of the world. Australia’s growing and ageing population has risen to the top of the national debate, with concerns over skill shortages balanced against concerns regarding the continent’s environmental carrying capacity in the face of global warming and other challenges. Current considerations regarding housing and transport, hospitals and aged care facilities, food production and employment must increasingly be led by an overarching population policy. To celebrate Global Access Partners’ National Economic Review 2011: Australia’s Annual Growth Summit, this month we are highlighting housing, transport, health, immigration, employment and other key issues surrounding population in Australia.